This is a trick-taking card game, which may be played individually or in partnerships of 2 or 3. 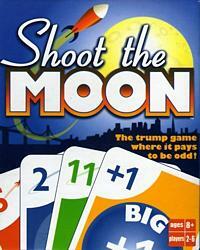 The game comes with a deck of 52 cards, made up of 4 colored sets of 12 cards (numbered 1 to 12) - the colored sets are suits of red rockets (always trump), green crescent moons, purple stars and blue full moons. There are also 2 orange big moon (bonus cards, always high), 2 orange little moon cards (penalty cards, always low) and 40 Shoot the Moon chips. Players start with 2 chips and are dealt 5 cards for each round of play. Players gain chips by winning odd number of tricks or the big moon cards. The first player to win 7 chips wins.